Between International Women’s Day, Saint Patrick’s Day and Easter, there’s lots going on in the capital this March. 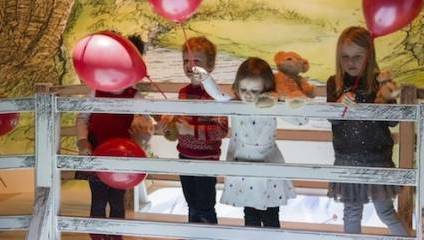 This month is your last chance to see Winnie-the-Pooh: Exploring a Classic, an exhibition at the V&A that’s running until 8 April. Exploring the relationship between Pooh’s creator A.A. Milne and illustrator E.H. Shephard, the display includes drawings, letters, photographs and manuscripts alongside more recent items like a Cath Kidston Winnie-the-Pooh dress. The museum is also offering some free family activities to complement the exhibition, including short performances on Saturdays and the chance to make your own storybook on Sundays. Adult tickets for the exhibition are £8, with family concessions available. Artsy families can also take a trip to the Affordable Art Fair in Battersea, running from 8 - 11 March this year. While the kids might not be quite ready to start purchasing their own pieces yet, the fair offers a programme of tours and free workshops to appeal to all ages and abilities, as well as a free family pack. One of the activities on offer is with Artichoke Printmakers, who will show you how to create your own drypoint prints. At the Southbank Centre, young feminists can discover their inner activist at the Under 10’s Feminist Corner. In these hour-long workshops, which are part of the Women of the World festival from 7-11 March, children can discover what it means to be a girl, and what they can do to help make gender equality happen. There are separate sessions for girls aged six and seven (10 March), girls aged eight to ten (11 March) and boys aged eight to ten (10 March). Tickets are £5. While not the most obvious of family-oriented events, the Saint Patrick’s Day celebrations over the weekend of 17 and 18 March offer plenty of activities that don’t focus on quaffing green Guinness. On Saturday, Irish Film London runs a children’s screening and a shadow animation workshop for ages six and over. Sunday will be the big day, however, with the traditional parade featuring traditional Irish music, dancers and floats. Trafalgar Square is at the heart of the festivities, with a line-up of Irish artists taking to the main stage there, alongside a food and crafts market. The special family zone on Pall Mall provides some quieter entertainment, including games, workshops and performances based on Irish mythology. If mythological theatre is a bit proper for you, why not consider something truly off the wall, such as the unlikely-sounding show The Four Clowns of the Apocalypse. Brought to the stage by UK company Absolute Theatre and their Portuguese colleagues from Teatro Montemuro, Four Clowns promises to be a funny and magical play for the whole family. The Four Horsemen of the Apocalypse are assembled to fulfil their task of destroying the world, but find they’re actually quite incompetent at their jobs. Join the Horsemen as ‘they grapple with universal destruction and deckchairs’, at various dates and venues: 23 March at Canada Water Culture Space, 24 March at Vauxhall Gardens Community Centre, 26 March at OSO Arts Centre and 27-28 March at the Young Actors’ Theatre. The Easter weekend offers a number of entertainment options, with a variety of routes to go down. Families who favour a more traditional Easter activity might consider visiting the annual fixture of the Wintershall Players’ Passion of Jesus on Trafalgar Square. The free spectacle, which takes place twice on 30 March, has a cast of more than a hundred people in costume, alongside horses, doves and a donkey. It probably doesn’t need spelling out, but since the story does involve a crucifixion, parental guidance is advised here. A less traditional option is family weekend at Sadler’s Wells, which is based around balletLorent’s show Rumpelstiltskin. The company, well known for its spectacular dance adaptations of classic fairy tales, has collaborated with Poet Laureate Carol Ann Duffy and Doctor Who composer Murray Gold on this latest venture, which is suitable for ages seven and over. Alongside the show, there will be all sorts of family activities taking place throughout the building, including dance workshops for parents and children, and arts and crafts activities in the foyer. Rumpelstiltskin is at Sadler’s Wells 30 & 31 March. Tickets are £18 for adults and £12 for children.